Sanook went to town with effusive praise of a Thai man who ensured that a lost child was reunited with her parents. The man had seen the four year old wandering by a road near a market in Bang Bung, Chonburi on Sunday. He took the little girl - who is Chinese - into the police station. There no one could manage to communicate with the little girl - even a Chinese language teacher who was asked to help found it impossible. The four year old had only just come to live in Thailand. But all was resolved when the anguished parents arrived to report her missing. The mother burst into floods of tears hugging her child not realizing that she was safe. She said that the family had arrived at the market in a car and gran and the child had got out first while they looked for a parking space. But gran had got separated from the child. "I have got a child myself. It was my duty. Everyone should do such a thing and not expect a reward". Sanook called him "more handsome than a male deity" in their headline. Not to take anything away from this good Samaritan's efforts, but you remember that Malian immigrant who scaled 4 stories up the face of a Paris apartment building to rescue a child dangling on a ledge? You remember how Macron rewarded him with French citizenship for his efforts? 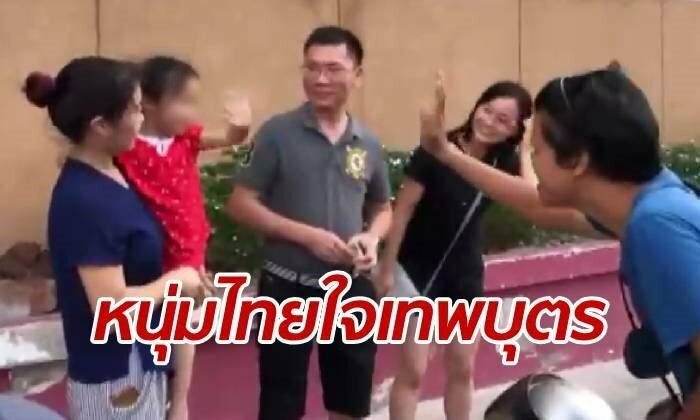 Can't help wonder if some foreigner on overstay rescued a kid from a burning building or did something heroic like that, would Thailand reward him with a Elite Visa or something? Probably asking too much, huh? He'd be lucky if his overstay fines were waived, or if he got to stay in the VIP lounge at Suwannaphumi on his way to getting deported. They might even fine him for working illegally. Just gonna buy a box of matches and a can of gasoline. The child was under the supervision of the grandmother. would Thailand reward him with a Elite Visa or something? 500 Baht and one of those Brand's Chicken Essence baskets. In order to claim the reward the foreigner would need to attend hundreds of hours of photo sessions with endless government officials. Then an overzealous immigration or police officer would demand to see his passport. ... And they all rode home on a motorbike without a helmet between them and lived happily ever after. I dunno, isnt that regular behavior ? If you see a Child lost , take it to safety . Heart of an angel? He could have been accused of kidnapping if anyone saw him en route to the cop shop.